A first victory of the season helps lifts some of the anxiety that the sale of Marc McNulty and some rusty early showings has engendered. The performance against Plymouth won’t live long in the memory, but it got the job done and there’s an opportunity now to build some momentum with this away trip to a managerless, and winless, Blackpool side. The current formation and team selection feels like square pegs in round holes, but with Luke Thomas and Jordan Shipley having made an impact from the bench on Saturday, and Reise Allassani – unlikely to be involved tonight after his inclusion with the under-23s yesterday – in good form with the reserve side, there is genuine competition for places in attack for Jordy Hiwula, Tony Andreu and Tom Bayliss to contend with. Of course, having a bounty of options available isn’t necessarily conducive to consistency. Mark Robins has to find a way to balance allowing players to bed into the side, while rewarding those who are making cases for inclusion via performances from the bench or with the reserves. With that in mind, the likes of Allassani, Shipley and Thomas could find their opportunities somewhat limited in the immediate future. That being said, it wouldn’t be surprising if one of Andreu or Hiwula were taken out of the side, having faded slightly over the course of the 90 minutes on Saturday. It could well provide an opportunity for Luke Thomas to build on his impactful cameo against Plymouth, or for Jordan Shipley to be utilised to make us sturdier for an away game, especially after Brandon Mason was left isolated at times on Saturday at left-back. In defence, it’s not quite clear who is and isn’t fully-fit. It seems Liam O’Brien will continue in goal while Lee Burge recovers from the knock that has kept him out of the opening weeks of the season. Tom Davies wasn’t even in the squad on Saturday but may return, Jordan Willis lasted 90 minutes against Plymouth but is seemingly not at 100%. March 2016, Tony Mowbray’s Coventry City are nosediving down the table. A young, exciting team have run out of steam and are in desperate need of inspiration. Enter Marc-Antoine Fortuné. On a pudding of a pitch, Fortuné did what he did best for us, provided a physical object for opponents to attempt to circumnavigate. After outmuscling – without actually moving too much – the Blackpool goalkeeper Colin Doyle from a set-piece, Fortuné diverted the ball into the net. A scrappy goal to decide a scrappy game. Blackpool were on course for relegation to League Two, and beyond, the last time we played them, however, thanks to the management of Gary Bowyer, the Seasiders have since won promotion and finished comfortably in mid-table in League One over the past two seasons. Nonetheless, the club remain in a state of anarchy, with fans continuing to boycott the ownership of the Oyston family. More recently, the Oystons lost a court battle with co-owner Valeri Belokon, and were ordered to pay £31m to buy him out. While this initially forced the Oystons to put the club up for sale, Blackpool remain under their control and they have missed several payment deadlines over the past year. This seemingly contributed to Gary Bowyer’s departure as manager after the first league game, although it was probably more remarkable that Bowyer’s exit hadn’t come sooner. Blackpool were roundly beaten at home by Portsmouth in the game following Bowyer’s exit, but went on to beat a second-string Barnsley side in the League Cup and drew 0-0 with Shrewsbury on Saturday. It isn’t clear how long caretaker manager Terry McPhillips will have in charge of the club, but it looks like he’s going to set the team up cautiously to keep the points ticking over before a permanent boss in put in place. While some key players from last year were lost over the summer, retaining former Liverpool and Bolton midfielder Jay Spearing was something of a coup for Blackpool. Spearing is now an experienced operator at the base of midfield, aggressive in the tackle and canny enough to break up play without picking up silly bookings. In central defence, Blackpool have Curtis Tilt, who impressed last season after stepping up from non-league and was heavily linked with a move to Ipswich over the summer. 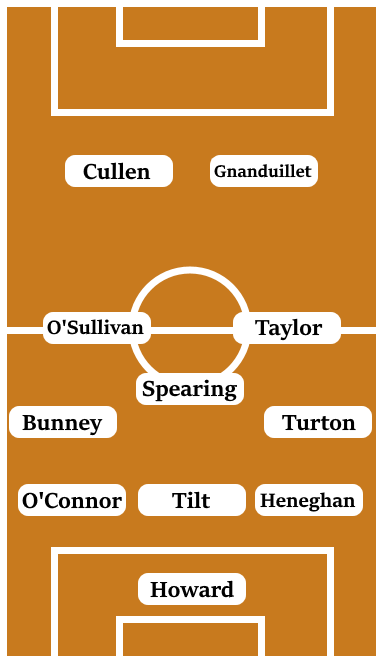 With Tilt playing alongside loanees Paudie O’Connor and Ben Heneghan – from Leeds and Sheffield United, respectively – Blackpool will have a physical and powerful back three. There may well be space to be exploited behind left wing-back Joe Bunney, who has spent most of his career playing as a striker. Blackpool are likely to struggle for goals and creativity this season, although Mark Cullen’s work-rate in attack alongside the physical presence of Armand Gnanduillet is potentially difficult to defend against when both are on top form. Former Sky Blue Nathan Delfouneso is another regular option in attack for Blackpool and is a reasonable, although not reliable, source of goals for them. This is a good opportunity to pick up back-to-back wins here against a Blackpool side that looks set to be among the relegation contenders this season. The main concern here is whether we have the fitness and tactical cohesion at this stage of the season to navigate a winnable Tuesday night away game. Having yet to score from open play this season, I’m not convinced there is the firepower in this side to win this game in the manner we should be looking to do. I can see this being a 0-0 draw.